Hello, all! First of all, I wish you a very happy and prosperous new year. I hope everyone are doing well with their blogs/websites. In this new year, here comes my first article about AdSense upgrade. Today we are going to discuss a topic about upgrading or converting your hosted AdSense account to normal or fully approved AdSense account. Everyone knows how to get approved for hosted AdSense account and how to get an Adsense approval i.e., fully hosted one, but few of them are not aware of getting upgraded to fully approved AdSense account from hosted one. So, I am going to explain you the differences between hosted AdSense account and normal AdSense account. At the same time, I will explain you the procedure to convert your hosted AdSense account to normal AdSense account. Both hosted AdSense account and non-hosted AdSense account has one major difference. The difference is as follows. Day by day google AdSense is becoming smart. They have modified and included many terms and conditions regarding AdSense approval and usage of accounts. Before times, we have the option to use hosted AdSense account on Blogspot, youtube and via third party sites, we are using it in site/website. But, now it is totally changed. Now, it is not possible to use hosted AdSense account in websites (Example: www.alltop9.com). See the difference below. The AdSense account that got approved via the third party hosted partnered sites such as YouTube, Blogspot or Hubpages. That mean if you got an AdSense approval using these third party sites, you cannot use this AdSense account to show ads on any other domain name or site. Adsense hosted account is an account, where you can display ads only on Youtube, Blogspot, HubPages (sites which let you apply for an AdSense and use ad code on that domain itself). This is the actual working of hosted AdSense account as of now. Fully approved AdSense is also known as non-hosted AdSense or a normal AdSense account. Normal Adsense account is nothing but upgrade version of hosted-AdSense account which is approved via non-hosted partnered sites such as sites/domains which are owned by you. Example, www.alltop9.com. This Fully approved AdSense account can be used on any sites/domain which are owned by you. 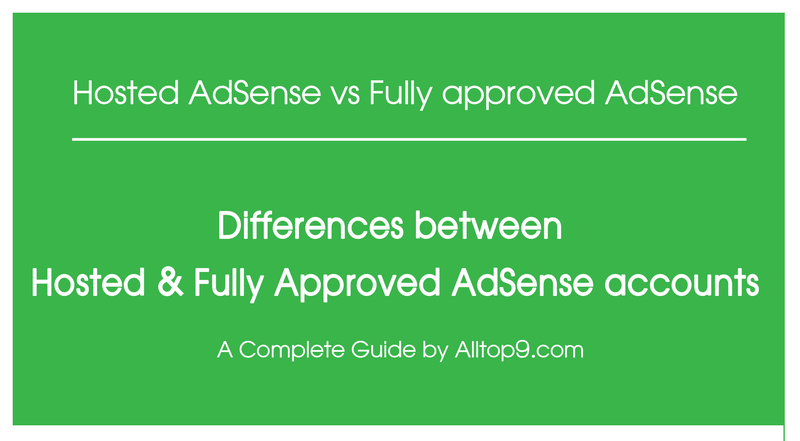 This is the only difference between the non-hosted or normal AdSense account and the hosted AdSense account. I hope you have got a clarity between hosted AdSense account and non-hosted AdSense account. If you have any doubts regarding this topic let me know in your comments. How to find out that the account is hosted or fully approved AdSense? Well, many of them will buy AdSense accounts from others without knowing whether it is hosted one or fully approved AdSense. Also, most of them are not aware which account can be used on which platforms. Fine! We can easily identify the hosted AdSense account as the account itself shows the label as hosted account. Below image is the screenshot of hosted AdSense account. 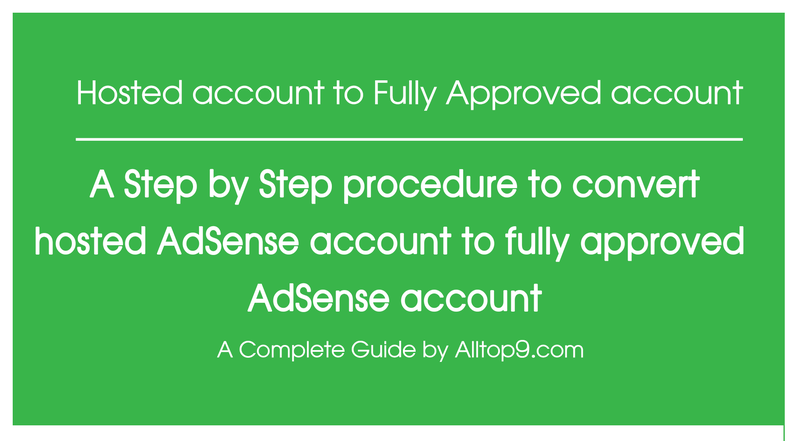 Whereas, the fully approved AdSense account will not show any label as shown in the image below. In this below image, there is no label of hosted account or anything. This type of account can be said as fully approved normal AdSense account where you can use it on websites/blogs. Well, You’ve to remove the label on hosted AdSense account in order to show ads on any other site/domain. The label removal is nothing but upgrading or converting hosted AdSense account to fully approved normal AdSense account. To upgrade Adsense hosted account to normal account, you need a quality website. Because Google is not going to approve any spammy blog or the one with poor content or copied content. I have written a complete detailed article with tips and tricks before applying for Adsense. Here are some quick tips you must follow before requesting Google to upgrade your Adsense hosted account to normal account. See that your website is loading fast. If not, optimize it. Now, let us discuss the procedure to convert AdSense hosted to AdSense non-hosted account. You may also be interested in this article. 30+ Best Google AdSense Alternatives. Sign into your Google AdSense accounts with the same email id which you are using for hosted account. As you can gear icon on the top right side. Click on it and go to settings as shown in the image below. In the left sidebar, you can find Access and authorization option. Click on it. In the “Show ads on other websites” section, enter the URL of the site where you plan to show ads and then click on Submit. After submission, you have to implement ad code on the website which you have provided in step 4. If you don’t know about ad creation. Watch the below video. Note: Once you implemented the ad code in the website/blog, the ad units will remain blank until your request has been approved by Google AdSense team. Once your request is approved, you’re welcome to place your ad code on any website that you own without any further approvals. If your application is not approved, be assured that ad serving on your host partner site will not be affected. You can continue to monetize your hosted content as normal. That’s all you are done with the procedure. After getting an AdSense approval, it is very important to secure your account. Because, if you misuse your AdSense account, Google may ban it anytime. Here are few reasons why Google bans AdSense accounts. Read out these reasons and secure your account. That’s all you are done with the procedure. This is the method to upgrade or convert your hosted AdSense account to normal or non-hosted or fully approved AdSense account. I hope this article helps you to create your own AdSense approval. My personal suggestion is to approve Adsense account on your own rather than buying it from others. Never buy an account until and unless they are good at AdSense. Well, if you still have any doubts regarding AdSense, let me know in your comments below. Feel free to ask, if you are uncomfortable to ask in comments, contact me directly by filling the contact us form. Thank you Gowtham Krishna for your feedback. Lasya you are really awesome, especially with ‘AD-SENSE’ related content, it is wonderful! Thanks a lot, great quality work from your side! I RECOMMEND you to come up with more posts like thsi! Thanks for your genuine replies time to time….! Can we apply for AdSense twice on same website? There is no chance to apply AdSense second time on the same website. You can apply adsense on that website the second time, but if you apply adsense the third time it will not be approved and their are chances that previous adsense accounts get banned or discontinued. Yes! Vishal. I have done this as an experiment in previous days. I got AdSense approval for the second time too on the same website. After few days, when I tried again on another website it got rejected. After that tried many times. At last came to a conclusion that we may or may not get it. So, only a few times we may get. Most of the times we won’t get approval. That is the reason why I said we cannot get AdSense approval for the second time on the same website. i think the google adsense have changed the patten under ACCESS AND AUTHORIZATION tab please help me if you can. i want to remove my hosted account label in adsense to normal adsense account. If you don’t find the option you can directly apply to the AdSense by submitting the form to Google AdSense team. that 2 i did nt get approval from adsense..
Once you change your blogspot.com to domainname.com, then apply for AdSense after 45 days. Then you can easily get AdSense approval. If you have hosted adsense account for your blogspot.com then you can change as per the article. thank you for ur previous answers . When you change your xyz.blogspot.com to xyz.com, you won’t loose traffic to your website as your xyz.blogspot.com is redirected to xyz.com site. The traffic may little decrease or increase, but there won’t be total loss. Thank you for your feedback. Keep Visiting. where can i get free images and videos for blogger. please tell me. Thank you for your compliments. Keep Visiting. Thank you Shaikh Muneer for your compliments. I bought an EMD Domain few days ago in the godaddy auction, it has high CPC with good amount of exact monthly searches but later i came to know that domain has been black listed by the google (i checked it on ctrlq/sandbox). I don’t know who was the earlier owner and what he was doing with this domain, i just want to start a fresh website on it. Can you help me in removing banned from this domain. Hi lasya …valuable tips and tricks for Google AdSense approval thank you…. Hey Lasya….. Very Nice Article… I want to know your mothly Income reports. Please share your your income reports and inspire other bloggers like me… Thank you very much for ur cooperation in Adsense field. Thank you for your kind words. To get inspired, we need passion and the way they work rather than earnings. Earnings lead to disappointment when we don’t reach the target. So, I don’t think sharing earnings is a better idea. Knowledge is 100 times important than earnings. First knowledge and the secondary thing is earnings. I am sharing my knowledge here which is more important than earnings. So, I hope you do well in blogging and reach your targets. Thanks. Thank you so much for this useful post. I have a question, I have a website. This website has 5 posts . Can I apply with my website. If I apply using this site how any chance to get approve ? Please reply me. Nice post….keep the good work on. I Cannot able to submit my adsense application. whenever i try it says unfortunately you are not eligible for the application submission. So i try to convert my hosted account into normal adsense. Yesterday i request for my site but i’m not getting any email regarding that. Waiting for your reply. Thanks in advance! i cant do it my self,can you help me convert mine or better if you have a non hosted acoount to sell to me.i will be grateful to have one . Your post is very valuable for all bloggers who are suffering from Adsense application rejection by google. Moreover thanks for this great post. Except this one question in my mind like you have described in your above replies of comments “you can get approval of one or two accounts by single website”. But some people that are selling the Google adsense account, how they get approval for multiple accounts. My second question is how we can increase google adsense earning. Like I have blog and Adsense enabled on it. But earnings are nil. Also i have one hosted account and I have my own three YouTube channels and daily 400 to 500 page view and 20 to 30 clicks. But i am earning from that only 15 to 20 cents. So please help in this regard too. One of the most helpful post for those who are looking to convert hosted adsense account into non hosted adsense account. You have described it so well, I enjoyed it thoroughly. Thanks to sharing this noteworthy post with us. is it good ? i want to upgrade to Non-Hosted. Thank you for giving your valuable feedback. I will change it accordingly. Hello,Iam joined Google adsense since 29-06-2013.Google adsense accepted first stage and [host account]its work with my youtube channel and admob ads.But not accepted non-host account for display ads my website,Iam applied google adsense on 23-June-2016,my first stage passed already but second stage there is no reply via email accept or not and not show google adsense dashboard any reject message.Then Iam re-apply after 3 months on 02-October-2016.but there was no reply message receive 70 days more today reach my last application.My question is my request in under review process i can able to reapply ?.Reject application users only can able to reapply ?Iam re-applied on 02-October-2016 is show that my previous(23 June 2016) request is rejected or not? “your adsense account is awaiting approval”This warning message not show my blogger earnings tab.Please help me to approved Second stage for non-hosted account. Hello Looks like things has changed since you posted. However it’s very helpful to start and find the way up to the final requirements..
You explained well with screen shot. Thanks for this helpful article. Thanks for your feedback. Keep visiting. Thanks, Mam. You made my day. finally, Adsense was approved to my site. This is very informative post for me, thanks for sharing helpful tips. Yes, you can use the approved AdSense account to any number of sites. Make sure that other websites are legal sites. Hi! I just got my adsense account approved via youtube i.e. its yet not verified for address and I haven’t received PIN, can I attach my custom domain with this account and will it get approved or should I wait for address verification? this article really helped me i have my own hosted adsense account and i want to convert it to non hosted account. i need your help with Adsense. I love blogging and just got my AdSense account hosted. Can you tell me if I can make money with the hosted account? Also if there is anything that I should do now? Can I use a hosted account for admob.I have got my adsense account approved few days back. Now I want to use that account for admob.Please reply. If your Google AdSense is a fully approved account then you can use it for the website, youtube, Admob, Blogspot. A single account is enough to place ads on all the platforms. If your AdSense account is hosted account you can’t use it for AdMob, as well as websites only you can use it on youtube and Blogspot sites only. Useful content I hope my new blog well accepted by adsense without problems.